"My family really likes this on hot summer days. We think that the tart, sharp, salty, and sweet flavors teamed with the juicy/crunchy bits of cucumber and apple is amazing. Keep salad chilled until serving. Serve over mixed greens." 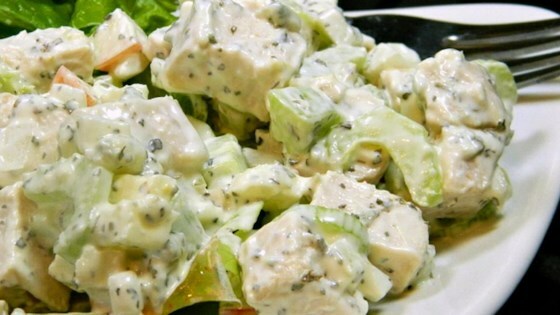 Mix chicken, bacon, cucumber, celery, and apple in a large bowl. Whisk mayonnaise, blue cheese, sweet onion, basil, lemon juice, ginger, Worcestershire sauce, salt, and pepper together in a bowl; pour over the chicken mixture and toss to coat. Cover bowl with plastic wrap and refrigerate until chilled, at least 20 minutes. I omitted the blue cheese because I did not have it on hand. I also used a whole apple rather than 1/4 cup. It was a very interesting mix of ingredients. I will definitely make it again.